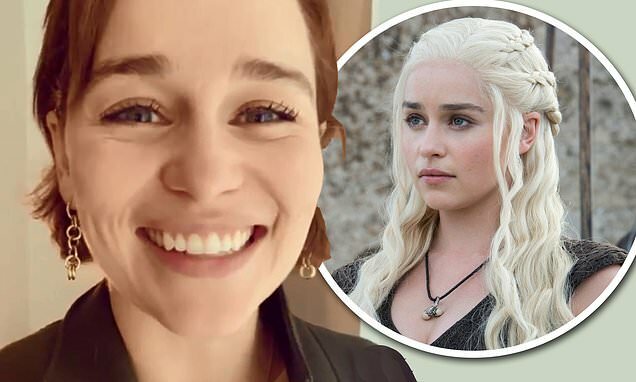 Emilia Clarke has shared a video thanking fans for their support after she revealed that she suffered and survived two brain aneurysms while filming Game Of Thrones. The 32-year-old actress took to Instagram on Friday, a day after first sharing her traumatic story, to offer 'a million thank yous' to everyone who had 'sent her love'. Emilia said that it is a 'beautiful thing to behold' that so many people had got in touch with their well-wishes, adding that she shocked by how many it has affected. In the caption of the clip, she penned: 'A million million thank you’s to everyone who has read shared and sent love for my story, it’s a beautiful thing to behold and I can’t quite believe how many of you this has affected! During the short clip Emilia said thank you to her supporters for their 'overwhelming' response to her story, before encouraging them to share their own stories. She said: 'Hi everyone, I had to put a video up to say thank you. The response from my story has been overwhelming and deeply and profoundly moving, so thank you so much. Emilia, who plays 'Mother of Dragons' Daenerys Targaryen, shared in a candid interview with the The New Yorker that she had her first aneurysm in 2011.